When Mystery Fiction meets either Historical Fiction or Period Piece—a mystery set in historical time. This enables the work to draw notice from both aficionados of mysteries and of historical fiction, and the attention to detail that is required in a good mystery can be put to good use in an environment that is both familiar and foreign at the same time. At the same time, this makes good historical mysteries into a very hard genre to master—both historical and mystery fiction are noted as very demanding in the research needed. One of the challenges is that is often forces the detective to use the skill and assumptions of his time period, rather than modern investigative techniques. In settings where professional detectives would be anachronistic, the investigator is often a Amateur Sleuth. The Black Dahlia (2006) is a fictionalized tale based on the real-life 1947 Elizabeth Short murder. It was adapted from a novel by James Ellroy. Chinatown and its sequel The Two Jakes take place in the 30s near LA. The Film Of The Book of The Name of the Rose (1986) has Sean Connery as William of Baskerville, a monk investigating mysterious deaths in a fourteenth-century abbey. L.A. Confidential is a mystery that takes place in 1950s Los Angeles. The Limehouse Golem: A Serial Killer investigation in pre-Jack the Ripper London. The Bletchley Circle: four former World War II codebreakers solve crimes in 1952 London. Cadfael is a TV adaptation of the Brother Cadfael book series. In BBC America's 2012 Copper Kevin Corcoran is an Irish immigrant living in the Five Points neighborhood of New York City during the 1860s. He returns from fighting in the American Civil War to find that his daughter is dead and his wife has disappeared. Robert Morehouse, Corcoran's former commanding officer, uses his family's connections to arrange for Corcoran to be appointed a detective in the New York Police Department. Foyle's War is British Series about a Detective Chief Superintendent Christopher Foyle. It is set during World War II. The Frankie Drake Mysteries were set in the Canada of the 1920s. Miss Fisher's Murder Mysteries started a TV adaptation of the Phryne Fisher novels by Kerry Greenwood, set in the late 1920's, although some later episodes have plots not based on the novels. Mob City is set after the end of World War II. Murdoch Mysteries is set in Canada in the late nineteenth/start of the twentieth century. Grantchester is set in the 1950s and often deals with how World War Two continues to affect an entire generation. The Amelia Peabody series blends mystery, romance, and comedy in its stories about crime solving Egyptologists. The series spans a thirty-eight-year period from 1884 to 1923, with most of the stories taking place in Egypt. The American Girls series had a spinoff line actually called "American Girls History Mysteries" featuring characters unconnected to their main lines, but having the same little section about the historical part in the back. The main lines have spin off mysteries too. David Liss's A Conspiracy of Paper, is the first of a series of novels about Benjamin Weaver, an ex-boxer and thief-taker living in the London of the early 1720s. The mysteries revolve around historical subjects such as the South Sea Bubble and the General Election of 1722. The Aristotle Detective series by Margaret Doody has the historic philosopher Aristotle help his fictional student Stephanous solve mysteries and navigate Athenian politics during the age of Alexander the Great. The Benjamin January books by Barbara Hambly tells the story of a free man of color (also the title of the first book) who investigates crime in the city of New Orleans of the 1830s, between working as a pianist and a surgeon. 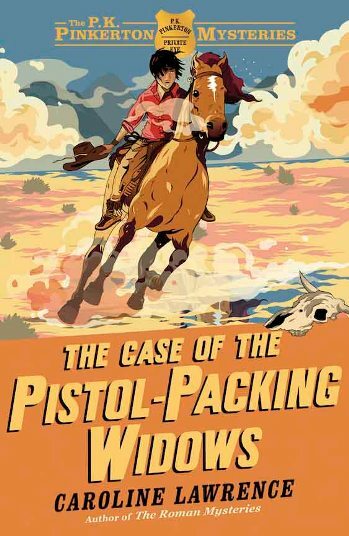 The Ben Snow series by Edward D. Hoch is a series of American Old West mysteries set around the turn of the 20th century. These tales are carefully researched historical pieces, sometimes including real historical characters such as Butch Cassidy. The Brother Cadfael series is about a medieval British monk who frequently ends up investigating crimes. The Charlotte and Thomas Pitt Series is set in Victorian Britain, and was first begun by Anne Perry in the 1970s. The Crowner John Mysteries is about the newly appointed King's Coroner for Devon in the late 12th Century. Death Comes as the End, by Agatha Christie, is set in Egypt circa 2000 BC. Published in 1944, it's the Ur-Example as the first full-length novel in the genre. Detectives in Togas is a Kid Detective series set in Ancient Rome. The Elizabethan Theatre series by Edward Marston, featuring Nicholas Bracewell, stage manager (and amateur detective) for one of Elizabethan London leading theatrical companies. The Enola Holmes Mysteries stars Enola Holmes as the 14 year old kid sister of Sherlock Holmes. While the original Sherlock Holmes stories would not be considered historical fiction because they are contemporary to the time they were written, these stories were written in the 21st century. The Erast Fandorin cycle of novels, set in Imperial Russia, and sometimes Imperial Japan. Alan Gordon's Fools Guild series, which follows Feste, the jester from Shakespeare's Twelfth Night. The Gareth And Gwen series in Medieval Wales. Judge Dee is a series of novels about a Tang dynasty official in 7th century AD China, who solves various mysteries ranging from domestic crimes to conspiracies against the throne. The Julian Kestrel series of mystery novels by Kate Ross, featuring the eponymous Regency dandy and his Cockney valet Dipper. The Justin de Quincy mysteries, by Sharon Kay Penman, are set during the rule of Richard the Lionheart (though mostly while he is away crusading, and Eleanor of Aquitaine and his brother John are jockeying for power in England). Jakub Szamalek's Polish series about Leochares, an ancient Greek detective living in Athens in the 5th century BC. Groucho Marx, Master Detective and its sequels by Robert Goulart, which portrays Grouch as an Amateur Sleuth in 1930s Hollywood. The Marcus Didius Falco series, set in ancient Rome at the time of the Emperor Vespasian. The Matthew Hawkwood series is about the exploits of Matthew Hawkwood, a Bow Street Runner in Regency London. The Mistress of the Art of Death series is set in Plantagenet England (the 1170s, specifically). The Mr. and Mrs. Darcy Mysteries series follows Elizabeth and Mr. Darcy as they solve the crimes they encounter. The Monk Series by Ann Perry is set in Victorian London in the 1850s through the 1860s. The title character, William Monk, is at various times in the series a police detective or a Private Detective. Murder at Colefax Manor is set in the rarely-used county of Cornwall in late 1800s Victorian Britain. The Name of the Rose by Umberto Eco is the story of the monk William with his novice sidekick Adso as they visit a famous monastery and investigate several mysterious deaths there. Onihei Hankachou is set in Edo-era Japan where the Tokugawa Shogunate has the Arson and Theft Control office, a team of officers appointed to investigate crimes of arson and robbery against civilians and officials alike. Kerry Greenwood's Phryne Fisher novels are set in and around Melbourne (Australia) in the 1920s. Ann Perry's Pitt Series is set in Victorian London in the 1880s through the 1890s. Thomas Pitt starts out as an ordinary Scotland Yard Inspector at the famous Bow Street police station and eventually works his way up to the head of Special Branch . His wife, Charlotte Pitt, is a well born lady who sometimes uses her social status to assist her husband by investigating parts of upper-class female society that are not easily accessible by police officers. Andrew Pepper's A Pyke Mystery series features the titular character as a Bow Street Runner turned private investigator, who works in the 1840s, at the time when the new railways are opening up Britain as never before. The Roman Mysteries is a Kid Detective series by Caroline Lawrence, set in The Roman Empire. The Roman Mystery Scrolls is a sequel to The Roman Mysteries, intended for younger readers. Roma Sub Rosa is a Detective Fiction series by Steven Saylor, about a Private Detective called "Gordianus the Finder." Like the SPQR Series, it takes place during the final years of The Roman Republic. The Sage Adair Historical Mysteries follow an undercover labor activist in the Pacific Northwest at the turn of the 20th century. Sano Ichiro revolves around the trials of a samurai of the Edo period who serves as the shogun's personal investigator. It plays fast and loose with many Historical Domain Characters of Japanese history. Simon Hawke's Shakespeare And Smythe mystery series includes A Mystery of Errors, The Slaying of the Shrew, Much Ado About Murder, and The Merchant of Vengeance. They're all about William Shakespeare and a friend solving mysteries which bear strong parallels to Shakespeare's. The Sister Fidelma mysteries by Peter Tremayne, where the sleuthing protagonist is a lawyer nun in 7th century Ireland. Sister Pelagia by the same author as Erast Fandorin series, described as "Father Brown, Russian-style". The SPQR Series by John Maddox Roberts follows the sleuthing and political career of Senator Decius Caecilius Metellus during the final years of The Roman Republic. The Western Mysteries, also known as The PK Pinkerton Mysteries, is a Kid Detective series by Caroline Lawrence set the The Wild West. The Shardlake series by C J Sansom has the lawyer Matthew Shardlake solve mysteries in the Tudor court of Henry VIII. The Yashim Series by Jason Goodwin is set in Istanbul during the 1830s. The Invisible Hours, an Environmental Narrative Game set in a Genteel Interbellum Setting. L.A. Noire takes place in Los Angeles in the forties and even has the option to set the game to monochrome to fit the Film Noir feel.